After deciding which hanging bird cage you want to buy, next you need to think about the bird cage stand that will be used to hold the cage. There are 3 main types of bird cage stand: 1) Regular bird cage stands that come in rectangular or circular shapes, 2) Hanging bird cage stands and 3) Bird play stands. The bird stand needed depends upon a number of things including the dimensions of your bird cage, the durability, how easy it is to move, price and how easy it is to maintain etc. We’ve studied each bird cage stand with these factors in mind and uncovered the best ones with detailed reviews. Just use the comparison table below to find out more. Check Price Hanging Height: 68"
Check Price Play Width: 17.6"
Check Price Play Width: 24"
Check Price Play Width: 29.53"
What to look for in a bird cage stand? 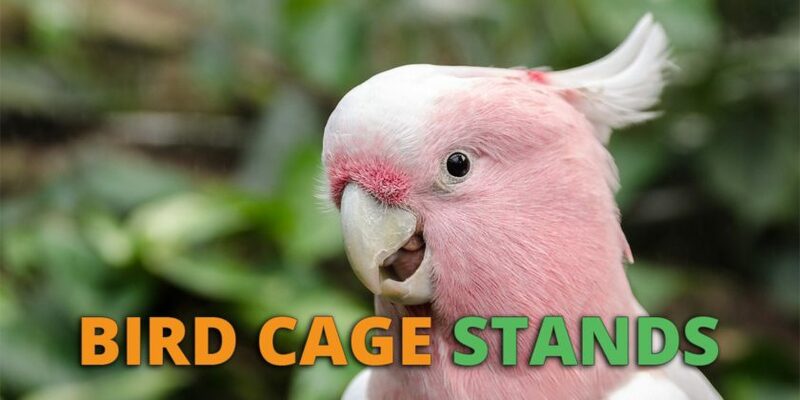 You need to measure your bird cage so that it matches the dimensions of your stand. If you’re getting a hanging bird cage stand then you should also consider the weight of the bird cage. People buying a bird play stand need not worry as much about a dimensions match up, but like the other stands, you should still measure out the space the stand will occupy in your home to check you have enough room. Check to see if the bird stand is easy to clean up and has features such as a removable floor which makes maintenance much easier. Also, check what material the stand is made out, especially with bird play gyms as they’re likely to get chewed. Some stands are have wheels on them and are intentionally made to move around a home whereas others are much more stationary (especially as the stands get larger in size). Consider whether being able to move the bird stand is a factor or not and then buy accordingly. Simple bird cage stands and hanging bird cage stands aren’t expensive and can be found for less than $50. On the other hand, bird play stands/bird play gyms are more complicated to build and so more expensive with their pricing around $50 to $200. Made from tubular steel with plastic casters. Very easy, 15 minutes max. Who this bird cage stand is for? If you own a square and rectangular bird cage and you want to make it mobile then this is for you. Just make sure it matches your bird cage dimensions as the stand is: 21″, length: 25″, height: 29.5″ first. This rolling bird cage stand from Prevue is very easy to assembly and all of the pieces are made from high quality, durable materials. Also the wheels move across the floor easily without much force making the stand very moveable. It’s a great buy if you have a bird cage that matches it’s dimensions or matches one of it’s models (see above). However, if the dimensions of the bird cage you’re using doesn’t match up to this stand then consider the (Vision bird cage stand) which has an open ended top. Simple and minimalist, the bird cage is the feature. Made of a heavy-duty tubular steel cage. Setup is straightforward but tweaking is needed to make the legs level. People that own small birds such as budgies. People that have cats or dogs. People that like the look of a hanging bird cage. This is the best hanging bird cage stand that is available for small birds. It’s very easy to move and to setup although some initial tweaking of the legs may be required. Multiple toys and features but one minor design issue. Sturdy and comes with a non-toxic, powder-coated, black finish. Can be setup within 10-20 minutes. 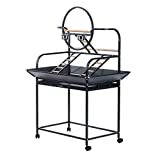 Lot’s included: x3 ladders, a swing, feeding and drinking stations, plus an extra storage shelf. Top bar is a bit too narrow for larger birds (but can be fixed by tying a small rope around it). For larger birds such as parrots/African Greys but also works with smaller birds as well. Bird play stands are great for keeping your birds happy and healthy and this parrot playstand is the almost perfect. Birds like to go for the highest perch and in this case the top bar is a bit too narrow. Fortunately this can easily be fixed by wrapping around a small bit of sisal rope around the top bar. Apart from this minor issue, it’s the best bird play stand as it just has so many toys that birds love and it’s made from high quality materials. The only thing better is the larger version that is available here. 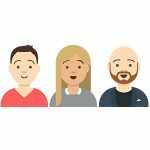 We try to keep these reviews up to date but if you have any further suggestions then please put them in the comment boxes below. Alternatively, if you’re instead looking to build (instead of buy) an aviary then check out the “How to Build An Aviary” guide that is available here where you can build at aviary at 80% of the cost of buying one. I have the large vision rectangle bird cage and want a rolling bird cage stand. What is the best stand in your opinion ? 1) Without wheels you could go with a stand such as this one and try a DIY job by adding castor wheels. 2) With wheels you’d need to find a rolling stand that matches the dimensions of your vision cage. Assuming you’re using the large L12 vision cage then the dimensions would need to match 29.5″ L x 15″ W. Or you could pick an existing bird cage stand with wheels, get an appropriate sized wooden board and then strap it to the top of the stand using bungee cords.